Surprising facts about climate change in Portugal: Why the climate catastrophe is not happening | Watts Up With That? Susana Costas of the University of Nebraska lead a team of researchers from the LNEG, the Universidade de Lisboa and the Universidade Lusófona in a study of the dunes and found five particularly stormy periods that had occurred during the past twelve millennia. Interestingly, all were related to climate cold phases. The last three of these windy phases coincide with the Little Ice Age and the Dark Ages Cold Period. Hence, empirical geological data do not support the simplistic idea that storm intensity in Portugal is increasing in Portugal as a consequence of global warming. The study by Susana Costa and her team was published in the Quaternary Science Reviews in May 2012. The claim that CO2 levels have risen over the past 150years is not based on fact but the Callendar 1948 paper that selected only data with CO2 levels at 285ppmv. Unfortunately for the IPCC the atmospheric CO2 content was enthusiastically measured throughout the 1800’s throughout Europe and levels went up to near 600ppmv in some data sets. So CO2 levels may have remained fairly constant for 150 years and the warming a natural result of coming out of the LIA. If the science is wrong – as all the scientific data indicates – then the predictions (or projections, if you prefer) of the models are worthless, and should be ignored. This means that “rational decarbonising” is NOT rational, it is scientific economic and financial lunacy. There is no need to try economic catastrophe, we have enough silly politicians always willing to spend other people’s money without adding ‘irrational decarbonizing’. Prior to the industrial revolution – over the preceding millions of years – the earth has experienced several ice ages, many warm periods, and CO2 levels were all over the place. In fact, during one of the ice ages, CO2 levels were far higher than today’s. NO ONE CAN EXPLAIN ANY OF THIS. This entire AGW thesis is the biggest scientific scam in the history of the world. It is a political movement, akin to a new communism or fascism , and nothing more than that. Climate “scientists” have sold their souls in pursuit of funding, money and personal influence and power promoting this scam, this farce. The scientific community will rue the day they supported this scam by remaining silent or actively supporting this hoax. Lysenko and his good pal Stalin are smiling in their graves. @johnmarshall, no, they may not. We have the time for rational decarbonising. They just finished pointing out that CO2 wasn’t bad at all and the claims of CO2 triggering catastrophe isn’t supported by the science…and then they make this statement? Why decarbonize in the first place? I wonder if the climate science community in general now accepts the data that shows just how widespread the various historic warm periods were? There does seem to be increasing evidence and if so, surely this needs explaining. Until we can explain the past warming we cannot be confident of explaining what the future climate might be. The confidence expressed by the IPCC is looking more and more foolish. Why? If CO2 levels really did vary between 285 ppmv and nearly 600 ppmv then the current rise to nearly 400 ppmv in the 1800s could be said to be “fairly constant” in historical terms. Particularly in the context of historic levels of 7,000 ppmv or more. Are you disputing the CO2 measurements in the 1800s or are you saying that any rise of 40%+ can never be called “fairly constant? @Solomon, I’m disputing the CO2 measurements in the 1800s. I don’t think they were done in the same conditions as they are done now in Mauna Loa, and therefore were not representative of average atmospheric concentrations, but contaminated by local CO2 sources instead. There are several types of nuclear power sources that are much safer from from potential catastrophic failure than some of the present ones, that if used at large scales would eliminated the need to be concerned for long term non-fossil fuel energy (I also need to point out that even with a few large nuclear accidents, nuclear has been historically far safer than the fossil fuel powered plants). In addition, a technology called the e-cat seems to be on a path for an energy source that can be even used at individual household level. While solar cells do not make sense as a primary energy source, they are good for some limited applications. If space solar power (beamed to Earth) can be made inexpensive enough (possibly using in-situ resources rather than lifting all materials from Earth), that can also contribute to a long term power source. Thus available and developing technologies can take up the load from decreasing availability of fossil fuels. This is best done with governments and other biased groups keeping their noses out of the natural economically driven development of new sources. This is a very interesting, well done article. Thank you. It makes it particularly clear that in Portugal, at least, we haven’t even made up the lost ground from the MWP to the LIA, and that both are absolutely real events, not Mann’s “stick part” of the hockey stick, erased as “inconvenient truth”. The sea level data is particularly interesting, given that Portugal’s coast is stable. It isn’t quite true that it is a proxy for the entire ocean, because thermally expanded water floats on top of colder water — the sea level “signal” (inside of the tidal and land uplift/subsidence “noise” that obscures it) is overwhelming the sea surface acting like a thermometer as the overall surface tries to maintain isostasis on a spinning oblate gravitationally irregular globe, plus an empirically tiny contribution from presumed global land ice melt. So the SLR data for Portugal almost perfectly reflects SST in the coastal waters, and by extension LST inland, just as it does everywhere else. As long as people continue to make mountains of money from the assertion of catastrophic warming and the diversion of an enormous fraction of public funds and energy into measures that even the proponents agree will not have any visible impact, little will change. One would think that the data would already suffice to change people’s minds about the certainty of catastrophe, but the chicken-little disaster meme is too well entrenched in our culture — only a return of the cold war or invasion by space aliens will suffice to distract the people from their guilt at being alive. ‘We have the time for rational decarbonising. This may be achieved by cost-improved and competitive renewable technologies placed at the best European sites, through higher energy efficiency and by improving the use of conventional fossil energy. New technologies should be promoted through start-up financing, but have to survive on the market over the longer term without subsidies. ‘The choice is no longer between global warming catastrophe and economic growth, but between economic catastrophe and climate sense. Firstly, why ‘decarbonise’ at all if the threat is not going to materialise? What we need to do is wean ourselves off intensive use of a fossil fuel resource that will deplete over the next century. The market will do it anyway….the cost of extraction for non-conventional fossil fuel resources like shale gas and tight-oil, tar sands and deep ocean fields is already clear, and apart from a few regional economic benefits – such as gas in the USA (and that will be brief at the current rates of depletion), the fossil fuel price remains high. It will go higher as conventional ‘cheap’ sources deplete further. But can we rely on the market alone? Not if we want to avoid hardship for the poorest. As for new technology – forget it! There are no serious candidates that will be cheaper. And the choice never was between global warming catastrophe and economic growth – and not just because the global warming threat was a mirage created by ambitious modelling labs who could not incorporate natural cycles. Also because perpetual economic growth is a mirage too – the last cycle of negative growth is likely to be repeated once the ‘stimulus’ of printing money in the West and massive unsustainable credit in the East finally kicks home. That will likely coincide with a temperature drop as it did in 2008. The reality is that all options – renewables, nuclear, and more efficiency, require more money that can be generated. The only ‘rational’ option is to use less – but that is a sure way to contract ‘the economy’ further. The obstacle to rational change is the entrenched interest of the money-makers and spinners that have so much influence over government. Whatever options are chosen, they have to benefit the banks, otherwise they don’t fly. Thats why Britains programme of energy efficiency and energy conservation is so pathetic…even though it is relatively cheap – it brings no great profits. Renewables are only supported if underwritten by government money and at high returns. Nuclear only gets off the ground in states with limited democratic accountability – or as was the case in France, under state monopoly backed by the jackboot and stun-grenade. Commentators who have great skill in assessing the inadequacy of climate science and picking apart the pervasive influence of the IPCC, should try to bring on board some energy policy expertise instead of making throwaway comments about what energy futures might be feasible. The problem is that EVERY generation thinks their generation will have an apocalypse. You can read it any any culture’s history. Darn it we’re special and we just HAVE to have an earth-shattering End Times! The increased rainfall results from the larger ionization atmosphere. Relative humidity remains constant in the lower stratosphere and upper decreases. Sorry, of course, in the troposphere. Indeed, why punish the biosphere with CO2 starvation if there is no need to? This madness of crowds needs to be taken by the horns by rational people and turned around as soon as possible. decarbonize in the first place? because you can feed the beast with anything it likes to hear. It doesnt matter what You SAY. Or what people ANSWER when asked in the streets. 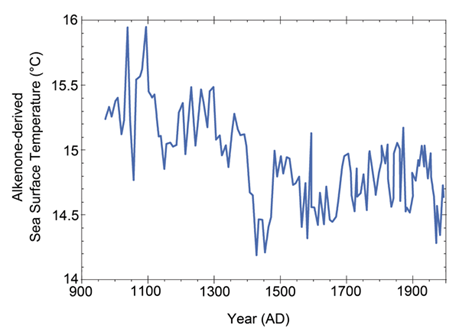 I’m sceptical that CO2 levels were below 285 over the past couple of thousand years. During the MWP, wine grapes were grown in Scotland, farmsteads fluorished in Greenland, etc . Low CO2 doesn’t jibe with this kind of situation. That CO2 is higher today than previously during the last 1000 years or so is the next bit of climate sophistry that is going to bite the dust. AR5 says that the sea level in 2100 assuming an increase in CO2 emissions for the rest of the century will be 23 cm higher than if we manage to make CO2 peak in this decade (or 30 cm if we assume the upper bounds). So on the question whether sea level rise calls for drastic CO2 emission cuts, the IPCC, if anyone listens, actually sends a clear message: Don’t bother. 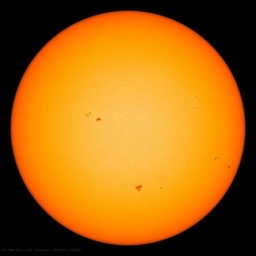 “The solar irradiance varies by about 0.1 percent over the approximate 11-year solar cycle, which would appear to be too small to have an impact on climate. Nevertheless, many observations suggest the presence of 11-year signals in various meteorological time series, eg, sea surface temperature ( White et al. 1997 ) and cloudiness over North America ( Udelhofen and Cess 2001 ). The flux of galactic cosmic rays (GCR) varies inversely with the solar cycle. Svensmark and Friis-Christensen (1997) suggested that GCR enhance low cloud formation, explaining variations on the order of 3 percent global total cloud cover over a solar cycle. A 3 percent cloud cover change corresponds to a radiative net change of about 0.5 W/m 2 (see above), which may be compared with the IPCC 2007 estimate of 1.6 W/m 2 for the total effect of all recognized climatic drivers 1750-2006, including release of greenhouse gasses from the burning of fossil fuels. If only they were discussing what might have gone wrong with their models we might be getting somewhere approaching sanity. Unfortunately this isn’t the case. The models are defended with ferocity and a total lack of objectivity. Until there rational proof of a problem, rational decarbonising is an OXYMORON. Until there rational proof that reducing CO2 will make a squat of difference, rational decarbonising is an OXYMORON. Us see AO exceptional fall in 2010. In general, high AO index values correspond to a strong polar vortex , and low AO values to a weak polar vortex. c) While the analogical station still exists and is working, the data nowadays is retrieved from a digital acoustic station that is 250m away…. the data of both stations matches closely enough ( see [url=http://dgterritorio.pt/eventos/comunicacoes/San_Sebastian/7ALEGG_Poster_Maregrafos.pdf]here[/url] … in , portuguese ). ren says August 5, 2014 at 6:16 am Relative humidity remains constant in the lower troposphere and upper decreases. That is so infinitesimal small it may as well be nothing. Explains why human warming or increased water vapor did not and could not occur. 3. Observations around the globe FAIL. AGW RIP can occur in November. The biggest scam in human history with take a fatal blow in November if enough hands are on deck making it clear how fraudulent the movement is. The scam side sent out as proof that temperatures are rising. It’s so repugnant it must be slain. A very convincing article: but will our political masters read it, and if they do, will they take any notice of it? Personally, I doubt if they ever read WUWT, as it will be dubbed a denier’s blog. @ren you are correct, and this is explained even in SkS’s article devoted to the Jet Stream. Now, this being true and well known and accepted by both climatologists and meteorologists, what I don’t understand is the need to link the “new” behaviour of the Jet Stream to Global Warming, when we already have an explanation through the AO and the NAO, which are both turning negative as they cyclically do, and this is known to cause a weaker jet stream. It must mean there is time to develop a rationale for decarbonizing as we currently lack one. I think I am right in saying that the preceding warm periods were all warmer than the MWP? Being the Roman, Minoan and the Holocene Optimum? All also of course with far less CO2 than today. Thank you for an interesting paper. Nylo, what makes you think the Hawaiian CO2 measurement is a good global average? It appears to vary a lot with altitude and that I would guess has varied with time. It is wise to conserve fossil fuel as it is a limited, fixed reserve. I happen to think Rossi’s E-Cat works and LENR will be the future solution. Look for the results of Elforsk’s six month test now expected in September. There seems to be ample scientifically established evidence that Nature is the culprit. The number of references in this article is impressive. Has the IPCC referenced and used any of these studies? Thanks Rolo. I gave up on this whole storey pretty quickly when I had a look at the paper. Tide gauge shows 0.5mm/yr then after “barometer adjustment” that becomes 3.3 mm/yr . WTF? Then they did a running mean on the data and the long term rate of sea rise changed again !! Well I’ve long been moaning about running means distorting the data but I’ve never seen them add a long term trend ! Then we read that the new acoustic tide gauge varied by 36 mm in the first 6 months but then was accurate to within less that mm. Yeah, right. If this is a region with very little earth movement, it is a great shame that they were unable to make proper tidal measurements. Portugal was an early member of the AGW victims club. Maybe we should hold up on their reparations payments. Decarbonizing, with AGW theory falsified? Europeans obviously have a more modest form of scepticism than that of North America, having basically been long compromised by advanced ‘socialization’. Their, dissent and opposition seem to be shades of gray (e.g. conservatives in UK are much left of center by our reckoning). Still, it’s good to see a bit of scepticism there, subdued or not. I’m hoping that honesty, truth, evidence and rigor are still sufficiently important in their science. The authors of this piece give some hope that there is a stubborn, small enclave of it and that what might appear wishy – washy is just European politesse. As I said above , rational decarbonising is an oxymoron. The sea levels measured at Cascais are presumably measured against the Portuguese Land Levelling Datum, which in turn is defined by Mean Sea Level, as nearly all such datums are. The circularity doesn’t usually matter very much, as we’re only looking for short-term trends. In this case, we should also consider the effect of adding some 140m of seawater load to the seabed over 11,000 years. My bet is that that weight has pulled down the seabed and the coastline along with it, so what we’re looking at is isostatic rebound. Does anyone know of any CO2 measurement datasets from Antarctica or Greenland? It seems to me that taking modern measurements from Hawaii and then comparing them to CO2 measurements from ice core samples is flawed methodology, since as many of you know, CO2 content in air is highly variable from place to place. Sorry, before inv. barom. it was only 0.2mm/yr , it worse than we thought. In fact, CO2 induced global warming seems to be an error. But, on the other hand, peak oil in combination with a colder climate during the next 20-40 years tells us to develop alternative energy sources, while it is an option. Us see AO index this year. It will still negative. Here you can see why this is happening. High pressure over the Arctic and low pressure than the far south Atlantic. Similarly is happening in the south. Low solar activity causes the weakening of the polar vortex and an increase in pressure over the poles. Climate change in Portugal seems to be going contrary to predictions. A bit long, but an excellent article. Thanks, Sebastian Lüning and Fritz Vahrenholt. Your factual presentation was needed. A long post, but that is what makes for excellence in our writing… Thanks for the study report …. How could it have been so warm when CO2 in the atmosphere was so low? 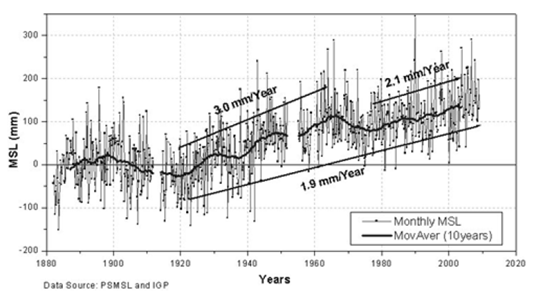 You report no sea level rise for the past thirty years while the above referred PSMSL. Data showed some significant rise, about 35 mm I believe. My experience has also shown that Public Service Mean Sea Level data are unreliable as shown by comparison of NOAA Gulf of Mexico mean sea level data against PSMSL data. The NOAA data (tidal gauge) showed no SL rise for at least sixteen years while PSMSL data showed a rising trend. The most interesting thing about this discrepancy is that PSMSL cited the NOAA as their source! To compare simply search for NOAA mean sea level. This brings me to my crucial point: NOAA mean sea level data for the US coasts show a flat sea level trend since before this century began. Now you say that at Cascais there has been no sea level rise for as long as 30 years. This may all be extrapolated to a world wide basis and concluded that there is no rising trend in the oceans worldwide, in a general sense. Sea level rise was mostly complete about 6,000 years or more years ago. Can you show what isostasy changes presently obtain? The coast there is stable. I ask you for data, not arm waving. Data showed some significant rise, about 35 mm I believe. Firstly the actual tide gauge data shows 0.2mm/yr x 30 = 6mm ! Do you really think anyone eye-balling the steps going down to the shore at various, uncontrolled times in the various tidal cycles can comment on that? Now if PMSL shows something different what _exactly_ are you looking at? Tide gauge readings or local “datum” relative figures? Please state what you are referring to. It is no secret what has gone wrong with their models. They steadfastly cling to the assumption that addition of carbon dioxide to the atmosphere causes greenhouse warming. That is the heart and soul of their greenhouse theory and it has turned out to be false. There has been no greenhouse warming whatsoever for the last 17 years despite a steady increase of atmospheric carbon dioxide. Their models are hard-wired to show warming when carbon dioxide goes up. Give them that increase of carbon dioxide and they spew out predictions of non-existent warming. You can see the result in CMIP5 projections. All the individual threads in it come from different supercomputers, and they all angle up predicting warming in the twenty-first century, while real temperature is a horizontal straight line. The Arrhenius greenhouse theory that they use has likewise been predicting warming for the last 17 years, while in the real world nothing happened. If a theory predicts warming for 17 years and nothing happens, a scientist is justified in tossing that theory into the waste basket of history. There is a spot reserved for it just next to phlogiston, another failed theory that took a generation to bury. But this leaves us seemingly without a greenhouse theory to guide us. Fortunately, that is not true because there is the Miskolczi greenhouse theory (MGT) that accurately describes the present pause/hiatus or whatever you want to call a cessation of warming. It came out in 2007 but IPCC did not like its predictions and has successfully suppressed any mention of it in the literature. Its prediction is exactly what we see today: addition of carbon dioxide to the atmosphere does not cause warming. This of course should be corroborated by independent observations. Miskolci did that in 2011, when he used NOAA radiosonde observations going back to 1948 to study absorption of IR by the atmosphere over time. What he discovered is that absorption had been constant for 61 years, while carbon dioxide at the same time went up by 21.6 percent. Constant absorption means no warming, and we have an exact parallel to the current no-warming hiatus/pause or whatever. To understand the mechanics involved, Miskolczi theory handles the behavior of several greenhouse gases simultaneously absorbing in the IR. Arrhenius cannot do this because it is limited to carbon dioxide alone and hence is incomplete. According to MGT carbon dioxide and water vapor, the two major GHGs in the atmosphere, establish a joint optimum absorption window in the infrared. Its optical thickness is 1.87, determined by Miskolci from first principles. If you now add carbon dioxide to the atmosphere, it will start to absorb in the IR, exactly as Arrhenius says. But this will increase the optical thickness. And as soon as it starts, water vapor will begin to diminish, rain out, and the original optical thickness is restored. The added carbon dioxide will keep absorbing of course, but it cannot cause any greenhouse warming because the reduction of water vapor cancels it out. The result is what we see today – no warming at all, while carbon dioxide keeps going up. This has some wide-ranging consequences. First of all, it makes a runaway greenhouse effect impossible. This explains why the very high carbon dioxide in geological history has been unable to cause runaway warming. But Hansen has been babbling about runaway warming and pointing to Venus as an example of what could happen to us. Unfortunately he is ignorant of Venusian geology as well, despite having been an astronomer on the Pioneer Venus project. Venus has no plate tectonics. On earth radioactive heat from the interior is constantly vented by plate boundary volcanism while on Venus it builds up beneath the crust until the crust breaks up into giant slabs. Its pieces sink into the interior and every 300 to 600 million years an entirely new crust is created. Its atmosphere is entirely a product of these giant eructations and not a result of oceans boiling as he would like us to believe. Closer to home, Miskolczi theory does not permit any enhanced greenhouse effect in the atmosphere. As a result, the anthropogenic global warming (AGW), attributed to the enhanced greenhouse effect by Hansen and IPCC, does not exist. AGW is thus nothing more than a pseudo-scientific fantasy, dreamed up by over-eager climate scientists wishing to prove that the greenhouse effect is real. After all, Hansen himself told the United States Senate that he personally discovered that greenhouse effect. His proof was that there had been a hundred year warming that could not happen by chance alone and this proved that the greenhouse effect did the warming. Checking his warming curve, however, shows that at least thirty of these hundred years were not greenhouse years. And that nullifies his claim. The people have had enough of dramatized reports predicting an imminent climate apocalypse just around the corner. According to a Eurobarometer poll conducted in July 2013, a mere 4% of the European population now cites the alleged climate catastrophe as their most pressing concern. Moreover, the number is zero percent in seven European countries, including Portugal. From the 2011 polling – Just over half (51%) of respondents consider climate change one of the world’s most serious problems (and 20% feel it is the single most serious problem). You are over stating the case. Wwe are in the negative phase of the 60y cycle and temps are flat, not showing noticeable cooling. That leaves at least the possibility of some AGW. What does seem to be disproved and it the real problem with the models is presumed positive feedbacks and the resultant high climate sensitivity. Pretending the recent lack of warming ( and ignoring the lack of notable cooling ) shows that CO2 has no warming effect at all is unjustified and does not advance the argument. I did state but the failure is yours. Go see for yourself. You have also misread Rolo’s figure. Go to the posting and it will help you in that figure- 15 mm/decade approx. 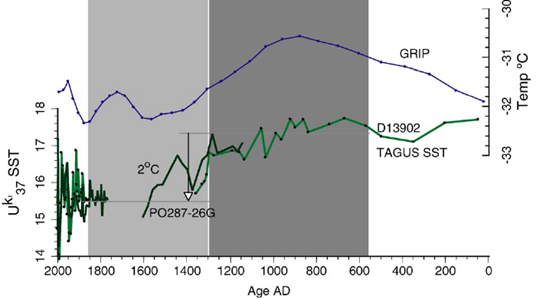 If CO2 lags temperature, and is a response to it, then (at any rate in the Northern Hemisphere) it is likely that CO2 levels were higher than 280ppm during the Minoan, the Roman and the Viking Warm Perods. The growth to which you refer is likely a product of beneficial environmental factors not limited to warmth but also including enriched CO2 fertilisation. As others have commented, if CO2 is not driving temperature and if the warming or the majority of it is natural why curb CO2? This raises the question of where all the extra water that is piling up off the portugese coast due to barometric effects is coming from. Go over to C.U. Boulder site and try to get the global mean sea level without the inv. barometer “adjustments” and you won’t get it. Ask and you will be ignored. WHY is there any inv. barometer adjustment being applied to _global_ MSL ? It does not make any sense. Barometric effects can only shift water around , it can not make water expand. I’ve always wondered also why UoC makes that ‘adjustment’. I suspect the measurement technology of 1000 years ago is less sophisticated than the thermometer floating around in my swimming pool. Think about it. 180 F of temperature range from ice to steam and measurements spanning 100 F in the rockies or what, 110 F span in Washington DC? Precision at half of least count, so we’re looking at measuring a degree over a thousand years and the pocket protector crowd wants us to get excited over half a degree, measured to a hundredth of a degree? I live on an island where it’s generally 4 F cooler on ‘my’ side of the mountains every day. I’ll challenge anyone to find someone who’s moved to the windward side of the mountain because it’s cooler. Arno, to reiterate what was recently said on another thread, can I rent you a paragraph break or two? Please break up your rhetoric into topical chunks. When you write one fifteen inch paragraph, I get to where I just don’t care long before I reach the end as I struggle to figure out where you change topics vs continue the old one. As it is, many of the points you make appear to be good ones, some not so good, but I’m not going to tease them sentence by sentence out of one long diatribe to comment. So PLEASE — break up your text into paragraphs like all the other (good) writers in the Universe. Bad writing is not an effective vehicle to use to make important points. Yes, you are correct and NASA imagery supports it. There is in fact a CO2 “hole” at the poles. In postings related to the Ozone hole, I’ve pointed out that only O2 in the atmosphere is paramagnetic – attracted to a mag field and all other gases are diamagnetic – REPELLED by a mag field. Although there are other things acting – weather, biochemical, etc. this effect should result in at least some enrichment of oxygen at the poles and diminishing of all other gases including ozone and carbon dioxide. The idea hasn’t gotten any traction. PSMSL through NOAA mean sea level data. Now, you might be incredulous at this but please reflect what else the global warmers have done in the name of science and think it possible that this is true. I agree very little. We have centuries of fossil fuels available. The global warming threat of a climate cataclysm from burning fossil fuels is about as close the the square-root of zero as can be without actually being zero. The market will respond to needs and changing conditions. There is no need to create artificial conditions by trying to regulate fossil fuels out of use and experimental energy sources into use. Things will sort themselves out. Thanks for having the patience to tease out “paragraphs” from the unbroken monologue and make some of the points I would have made if I had the patience. The fact of the matter is that we haven’t got a model for the climate that is even conceptually capable of explaining all that we know or believe on the basis of historical observation, and we don’t know whether or not many (possibly most!) of those beliefs are accurate. A lot of beliefs about the past state of the Earth’s climate and ecosystem are at heart a complex fiction, storytelling based on a thin layer of narrow observations, usually obscured by a nearly unknown coarse grained averaging over time, drawn from a tiny, tiny handful of sites around the planet and held to be generally representative without any possibility of verifying or falsifying the assertion. A lot of those beliefs are stated as if they were bald fact or displayed as if they are rock-solid “known truth” curves without error bars or any discussion of uncertainty whenever they are used by either side in the climate debate. A few of these beliefs do have enough supporting corroborative evidence that they are probably true enough, although perhaps not “true” enough to graph without error bars or uncertainties. Many of them are inferences on the thinnest of evidentiary support, attributing monovariate causes in a highly multivariate environment, with all sorts of possible confounding phenomena either completely ignored or summarily dismissed. Very, very few of them can be supported by a proper Bayesian argument with recomputed posterior probabilities that might at least give one a glimpse at how likely it is that the underlying assumptions (priors) are correct. At the moment, the best that we can say is that we have little to no idea whether or not CO_2 is (essentially) irrelevant to the evolution of the current climate, relevant and overall good for the world, relevant and overall bad for the world, relevant but unpredictably good and/or in a chaotic nonlinear multivariate system. We do not know which if any of the various assertions about CO_2’s direct radiative effect and/or the coupled feedback effects of the other greenhouse gases excluding water, the coupled feedback effects including water (which is enormously complex and almost completely misrepresented in climate model computations carried out at a scale that completely eliminates all of the important short distance short time dynamics of water vapor), the coupled feedback effects including other GHGs, water at all spatiotemporal resolutions, various aerosols, the hypothetical contribution from magnetically variable atmospheric radiation, soot, dust, pressure modulation of the GHE, and the coupled dynamics of the ocean (did I mention the ocean?) as a huge highly variably driven heat sink coupled to the global water cycle are correct! And let’s not forget the sun, the moon, geothermal and volcanic variability, orbital variability, non-Markovian dynamics including “sources” that are actually dynamic phenomena whose roots were laid down 100 or 500 or 1000 years ago. We only know that so far, they appear not to be accurately computable, so we cannot even assess their necessity or importance by comparing the results of computations with various treatments of all of these contributing factors to reality. We cannot, as has been noted, come up with a believable, computable, explanation of the MWP, the LIA, or the post-LIA warming with and/or without human contributions. We cannot describe even in gross terms the thermal history of the Pliestocene, assuming that our beliefs about that thermal history are well-founded and not a story, ditto the Holocene. There is considerable debate as to the cause of the Younger Dryas. And we have inadequate data to properly start even a perfectly accurate computation now using modern instrumentation. How the hell are we supposed to explain state evolution 500 years ago, from an initial state “measured” by reading verbal anecdotes or making inferences from the price of sheep in Scotland since thermometers and barometers and anemometers and physics and stuff like that hadn’t been invented yet? Well thought & said, as usual, although maybe shorter sentences with fewer parentheses might make your trenchant analysis more accessible to the laity. I think paleoclimatic studies can with some confidence however conclude that the recent, perhaps late, lamented, warming from the late 1970s, was nothing special in the Holocene & that this interglacial has been & is nothing special among interglacials. Dryas-like events have been found in the proxy data from prior interglacials, along with optima like the Holocene’s & subsequent warm intervals interspersed with cooler. Without knowing with great confidence the causes of these observed phenomena, IMO science can & should (although the non-scientifically driven “consensus” hasn’t) still conclude that the null hypothesis hasn’t been falsified, ie there’s no reason to posit humanity as the primary driver of climate since 1950 or whenever. It’s still colder now than for most of the Holocene, which has been cooler than at least two of the past four interglacials. Too many parentheses of my own. Excellent post. If you are a skeptic, this has to reinforce your position. If you are a warmist , it has to make you rethink your position. Every week I read information that makes CAGW a theory without legs. Who is going to be the last holdout? A one degree warmer than present Medieval Warm Period in the Iberian Peninsula sounds about right. Very roughly, globally IMO the MWP was about one degree warmer than now, the Roman Warm Period around two, the Minoan WP possibly three & the Holocene Climatic Optimum four or five. The Arctic during the HCO was up to nine degrees warmer, but the tropics only perhaps one degree. Earth is still in the long term cold trend which started either about 3000 during the Minoan WP or 5000 years ago, from the end of the HCO (longer from its height). You’ll love this one. Bottom of the following page. Sea level – tide gauge and satellite data side by side. Satellite data shows almost twice the rate of the tide gauges and no explanation from NASA whatsoever! Bit of a problem there, because I don’t think anyone has actually measured it, and I’m not sure how you could. Certainly Scandinavia is still rising, as, I think, are Northern Canada, etc., but that is because they were severely depressed by ice sheets. It stands to reason, though, that the addition of 140 tons per square metre on the seabed is going to have some effect, and I doubt it’s all over now. Thanks for your reply. The U of Colorado has a sea level fabrication machine operating and a part of that is a spurious ocean floor subsidence for which they add .3mm to compensate. Thus by this and other subterfuges they achieve a fabricated sea level rise of about 3mm per annum. I have great difficulty with claims of isostatic effect that are simply bald assertions. Tidal gauges which data is not so easily adulterated show a steady sea level except in locales where there is subsidence, in which case the gauge shows a SL rise or if there is local uplift then the gauge reads as a falling sea level. Such local effects are easily identified so any vague talk about isostatic movement unsupported by observation is not to be taken seriously. Susana Costas of the University of Nebraska lead a team of researchers from the LNEG, the Universidade de Lisboa and the Universidade Lusófona in a study of the dunes and found five particularly stormy periods that had occurred during the past twelve millennia. during one of the ice ages, CO2 levels were far higher than today’s. follow the links to his personal research. hypothesis. Again, a more plausible and increasingly better supported idea. No, Greg, I am calling it like it is. Your sixty year cycle and quite a few others that have no physical reason to exist is just a confusing occurrence, with no right to be called a cycle. When you are doing science you have to ignore such nonsense and presumed feedbacks as well in order to bring out the signal you are after. If this means killing some sacred cows, so be it. What you say about the models is true of course and shows additional reasons why they are wrong. Their high sensitivity is complete nonsense because real sensitivity is exactly zero. There can’t be anything else because increasing carbon dioxiode does not cause any warming. I don’t simply pretend that CO2 has no warming effect. I demonstrate it by observed facts. Unless you can show that these observations are wrong you cannot criticize my conclusions. Your hope that there is “… at least the possibility of some AGW…” is not based on any observations and is wrong. rgbatduke August 5, 2014 at 12:57 pm thanks Greg Goodman for “… having the patience to tease out ‘paragraphs’ from the unbroken monologue and make some of the points I would have made if I had the patience….” He is speaking of my comment here. Goodman’s points of course are irrelevant as I pointed out to him. Now we have rgbatduke who writes sentences sixty six words long complaining about an “unbroken monologue” to get away from discussing anything scientific that I wrote. You will not learn climate science, duke, with such childish tactics. Arno, to reiterate what was recently said on another thread, can I rent you a paragraph break or two? Of all people, you of the 66 word sentences acting like a grammarian? Ok, I will let it go this time because the management of this blog felt likewise and decided to break up my writing into paragraphs. Now you have no reason not to read it. Try to focus on science this time. Mona Loa data is collected from an instrument measuring IR radiation to estimate the CO2 content of the atmosphere. Considering that this volcano is one of five in the immediate area and all emit CO2 does not make for the best data set. This IR method has not been officially validated. Data collected in Europe during the 1800’s was carried out in various countries including UK, Germany and Italy using a chemical method, the method preferred today ”officially” . That the data varied is explained by seasonal changes, natural, and areal concentration due to emerging industry. For those delighting in the GHE recently published data from NOAA shows that for the past 14-15 years increasing GHG concentrations have been accompanied by REDUCING LIR. This is contrary to the favourite theory. “rational decarbonizing” not only doesn’t exist, it is an oxymoron, put forward by some morons whose brains are desperately short of oxy.